This weeks Monday Mani is on a particular nail polish. Out of all the mint green nail polishes that numerous brands have available, I have found, the one. Barry M *Sugar Apple* Nail Paint is one of the brands Gelly Hi-Shine range and this has the perfect amount of mint, blue and pastel which makes it perfect for my skin tone and the exact shade I have been looking for. But it is also quite bright and stands out even though it's pastel toned. ...There are many other mint polishes out there. From the likes of Rimmel's Breakfast in Bed or Maybelline Super Stay Nail Polish in Mint For Life. But surprisingly I haven't tried Essie Mint Candy Apple which I don't need to now. I love this polish and I just had to share it with you. Be warned, I will be wearing this even in the Autumn and Winter. 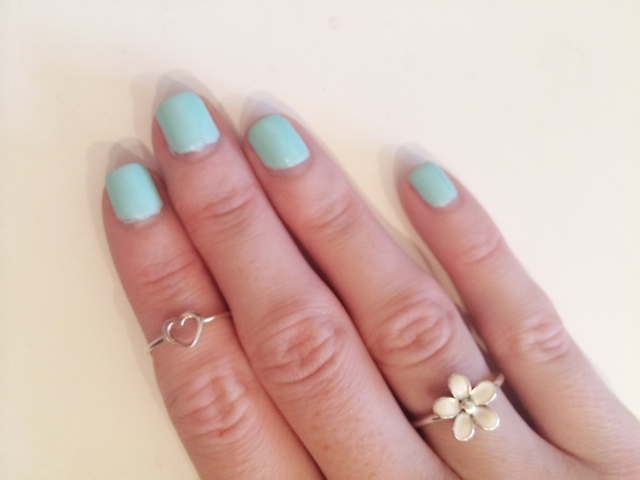 What's your fave mint green nail polish.